In a hurry? Here's a list of all our top picks with product links to save you time. "This food is specially designed to meet every nutritional need of a Westie from the ages of 10 months and up." "This chicken and brown rice formula contain only the highest quality natural ingredients that don't include poultry by-product meals, corn, soy, wheat, preservatives, or artificial flavoring." "This puppy food comes packed with essential vitamins, minerals, and nutrients to support healthy development and growth throughout your puppy's system." "Real meat comes listed as the first ingredient on the package, and it comes from a reliable source that follows strict quality control guidelines. " "This food comes loaded with essential vitamins, nutrients, and minerals like amino acids to help boost their immune system, improve their skin health, bring a healthy shine to their coats, and keep their eyes healthy." "For Westies with allergies or sensitive stomachs, a limited ingredient dog food can be very helpful in keeping any discomfort to a minimum." This food is specially designed to meet every nutritional need of a Westie from the ages of 10 months and up. This adult Westie food comes with a smaller kibble shape that is easy for your Westie to pick up, chew, and digest. This food is packed with essential Omega fatty acids to help keep your Westie's unique double coat shiny, hydrated, soft, and healthy. The amino acids in the food go to work to promote skin health, digestive health, and excellent coat health for as long as your dog eats it. Since adult Westies can be picky, this dry dog food has an exceptional flavor profile coupled with an appetizing aroma to keep your dog interested and eating. It also helps your dog have healthy teeth and gums because the specially shaped kibble will help to prevent plaque and tartar from building up. Westie parents who bought this food for their dog liked that it came with a special shape that was suited to their dog's more blunt muzzle and smaller teeth. Westie parents did mention that this adult food can leave a greasy residue behind. This senior dog food has real meat as the first ingredient on the package from a quality and local protein source. Your dog will also enjoy necessary ingredients like garden vegetables, fruit, and a variety of wholesome grains. The Blue Life Protection formula also contains higher amounts of glucosamine and chondroitin to help support their joints, bones, and immune systems as they age. The LifeSource Bits come formulated with antioxidants, vitamins, and minerals to provide support and protection for your dog's entire system. 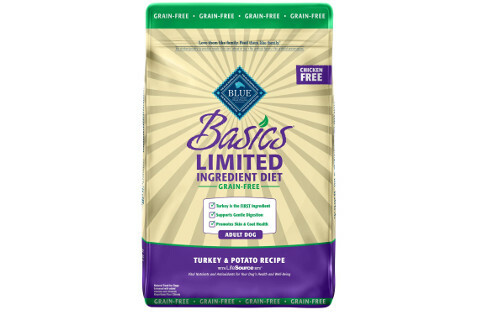 This chicken and brown rice formula contain only the highest quality natural ingredients that don't include poultry by-product meals, corn, soy, wheat, preservatives, or artificial flavoring. 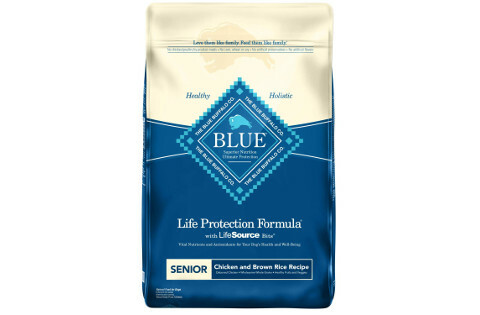 You can pick from three different sizes when you order Blue Buffalo Life Protection for seniors. Senior Westie parents who purchased this food were happy that it contains Blue's signature LifeSource Bits to give their dog a boost of minerals, vitamins, and antioxidants. Senior Westie parents did mention that this food had a slightly larger kibble that could be difficult for their dog to pick up. This small and toy breed puppy food comes with seven different styles, and you can also purchase a complete puppy kit. 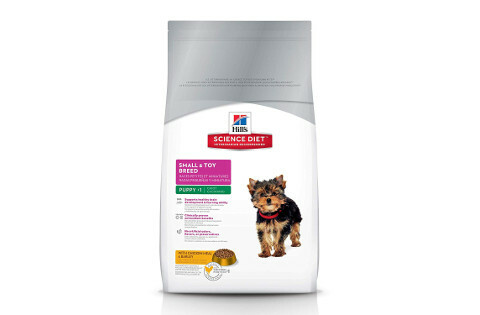 This food is specially designed for puppies up a year old and with a maximum weight of 25 pounds. Your puppy will get a healthy serving of natural DHA from fish oil that helps to promote healthy eyes and brain development each time they eat this food. 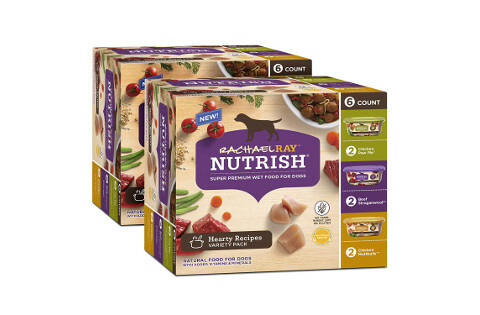 There are no artificial flavoring, colors, or preservatives in this puppy food for a healthier and more natural diet choice. This puppy food comes packed with essential vitamins, minerals, and nutrients to support healthy development and growth throughout your puppy's system. Your puppy will enjoy a premium list of ingredients that are naturally sourced from around the United States to strict quality control standards. Westie puppy owners who bought this food for their dog were happy that it contained higher levels of DHA from fish oil to support healthy brain and eye development. They did mention that this puppy food has a stronger smell when they first open the bag. You can choose from eight different variety packs and three different quantities when you order this wet dog food for your Westie. This food comes packed full of essential vitamins, minerals, and nutrients that help to support your dog's system as they grow. Your Westie will enjoy a natural formula that doesn't contain any soy, wheat, corn, gluten, filler ingredients, or poultry by-products. Real meat comes listed as the first ingredient on the package, and it comes from a reliable source that follows strict quality control guidelines. The plastic tubs that this food comes in is resealable, and this means that your dog will always have a fresh meal when it's time for them to eat. The different flavors and combinations mean that your dog will stay interested and entertained when it's mealtime. Westie parents who bought this wet dog food were happy that they got to choose from so many different varieties and quantities because this allows them to customize their order to suit their dog's taste. Westie parents were not happy that this food could cause mild digestive upset when they switched over. 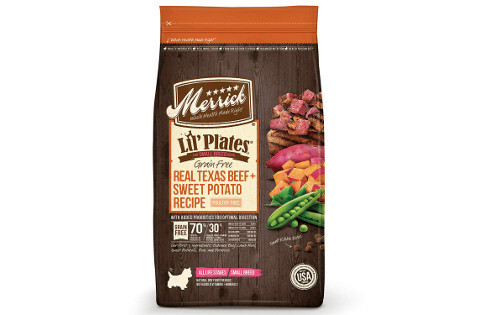 Merrick's dog food comes in four different sizes and five several different flavor combinations including lamb, chicken, beef, and salmon. Your Westie will enjoy a dog food that was manufactured in the United States to very strict quality control standards. This food comes loaded with essential vitamins, nutrients, and minerals like amino acids to help boost their immune system, improve their skin health, bring a healthy shine to their coats, and keep their eyes healthy. The small and crunchy kibble pieces help to clean any buildup from your dog's teeth to keep them healthy as well. You'll get probiotics and fiber to help balance your dog's digestive system and keep them regular when they eat this food. You can get a poultry-free recipe for dogs who have allergies or sensitivities, and real meat is the first ingredient listed on the package. Dog parents who bought Merrick's food liked that it comes with a healthy amount of probiotics and fiber to help keep their dog's digestive system regular. Dog parents didn't like that this food had a stronger smell that didn't seem to go away. For Westies with allergies or sensitive stomachs, a limited ingredient dog food can be very helpful in keeping any discomfort to a minimum. Your dog will get a single source of high-quality protein combined with easily digestible carbohydrates. This food features fatty acids for a healthy coat and skin, pumpkin to help soothe digestion, and LifeSource Bits that have a unique blend of antioxidants, vitamins, and minerals. This food contains no chicken, beef, wheat, soy, corn, dairy, eggs, artificial flavors, or artificial preservatives. The kibble is smaller and crunchy, and this makes it easy for your dog to eat. Additionally, it helps to clean any plaque or tartar from your dog's teeth to their gum line. This can help to improve their dental health and prevent infections or tooth decay. Dog parents who bought this food liked that it comes with a quality protein source, easily digestible carbohydrates, and Blue LifeSource Bits. Dog parents did say that the kibble may be too hard for older dogs to chew easily. Your Westie is a ball of energy and sass coupled with a strong will, and this can pose a challenge at mealtimes. You have to balance making sure that your dog gets all of their dietary requirements met while working around their tendency to be very fussy eaters. However, we've picked out the best dog food for Westies and performed mini-reviews on them because we want you to be able to compare them quickly and easily. We also put together a short guide that will outline nutritional information, important ingredients in your dog's food, and how much you should feed them each day. Additionally, AAFCO recommends that Westie owners stick to dry dog food over wet dog food because wet dog food can contain a lot of water with little nutrition. There can also be a lot of allergens like wheat products, gluten, soy, or corn. These things can set off your dog's digestive system and make them miserable. Adults - Most adult Westies need around 660 calories per day to help them get to and maintain a healthy weight. You should split their meals up into two or three smaller meals per day, and feed them at the same time each day to keep them on a schedule. Puppies - Most Westie puppies need a slightly lower amount of daily calories until they reach a year old, and you want to aim for around 435 calories each day. Puppies should get three smaller meals per day until they're six to nine months old, then you can switch feeding to twice a day. Seniors - Senior Westies typically eat smaller meals more frequently throughout the day, and they can have lower calories. The final calorie amount will depend on your dog's activity levels, and it can range from 400 to 550 calories. Antioxidants are critical for helping to boost your dog's immune system and keep them healthy throughout their lives. They also help to repair any cellular damage that your dog may have due to illnesses, accidents, or inflammation. Since your Westie is a smaller dog, they won't be able to eat as much throughout the day to meet their caloric requirements. Feeding them a food that is very calorie-dense allows you to feed them less and still ensure they hit their target. Westies need around 40 calories per pound of body weight per day. Since Westies are prone to developing allergies or skin conditions due to allergies, you want to double check the main sources of the carbohydrates in the food and make sure they're not corn, wheat, or soy products. Instead, look for potatoes, oats, barley, millet, vegetables, legumes, and whole grains. Westies have an interesting muzzle shape with smaller teeth that can make it difficult for them to eat anything other than standard dry dog food. Additionally, dry dog food can be instrumental in helping keep your dog's teeth, and gums clean and free of any decay or plaque build up. Fatty acids are essential for your dog's skin and coat health. Since Westies are prone to skin problems and issues with their double coat, you want to see a good level of fatty acids in their food. Fatty acids also help promote brain development in your Westie puppy. Your dog's food should have a lean protein source listed as one of the first ingredients. You can have poultry, meat, or fish as the protein source. Ideally, you want it to be high-quality and sourced from somewhere in the United States to ensure that it follows high quality control standards. Probiotics are live bacteria that help to add balance to your dog's digestive tract, and they also help your dog digest their food easier. Fiber is important because it helps your dog push their food through their system at a normal rate. This ensures that your dog doesn't have digestive upset after they eat. 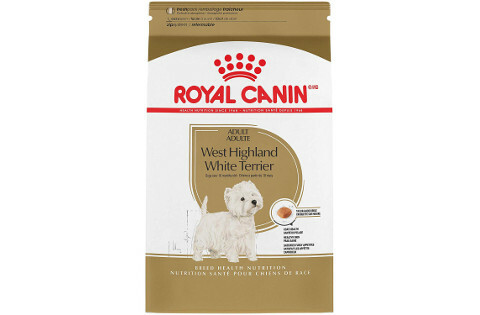 Our pick for the best dog food for your Westie is Royal Canin Breed Health Nutrition West Highland White Terrier Adult because it's specially formulated to support your dog's healthy growth and development from 10 months onward. It also comes with a specially designed kibble that is easy for Westies to pick up and chew, and this is important because they have more blunt muzzles. We also chose it because it's designed to have an exceptional flavor profile that can tempt your dog to come back again and again. Finally, we were happy that this food worked to keep the teeth and gums healthy and clean.